Aboriginal art is part of a very ancient culture. It took the form of rock, body and sand painting and weapon and implement painting and engraving and it was steeped in ceremony related to the Dreaming. Aboriginal art is part of a culture of great antiquity. It took the form of rock, body and sand painting and weapon and implement painting and engraving and it was steeped in ceremony related to the Dreaming1. Whilst those forms of art have been practised continuously, they have more recently found expression in paintings on board, or canvas or barks or poles. Individual Aboriginal artists may have developed their own aesthetic, which may have been affected to some degree by the recent development of a previously unknown market for Aboriginal art works, but the inspiration for the work has remained deeply rooted in the Dreaming. In even the most sophisticated works of modern Aboriginal art the connections to country and the ancestors and the Dreaming are constant visual echoes of what has gone before. There was photographic evidence left by the explorers and ethnographers Baldwin Spencer and Frank Gillen in 1912, photos showing ground paintings being made and body paint being applied prior to Aboriginal ceremonies2. It is interesting to see that what was once painted on bodies and sand is now replicated on canvas and barks. Ceremony and law is based on the Dreaming3. The Dreaming is a set of stories which describe how the land was created by ancestors who were both spirits and people and who live within the land and control its use. The Dreaming explains the layout of the land and sets the rules by which people live, being rules as to country and ownership and use of country. The most significant determinant of ownership of country was where one was born and where one’s parents were born. Only boys underwent initiation. Girls were instructed in a less formal way. Knowledge of the Dreaming was passed on orally at and following initiation. Learning the Dreaming is a continuous task throughout life. Much of the Dreaming is secret, known only to those who are instructed. This has a continuing consequence in Aboriginal art. As Mary Eagle notes: “In Aboriginal art there was insider art and outsider art. Insider art was of cryptic form understood only by people in the know. Outsider art was in a figurative style that was understood by many”4. Dreaming trails criss-cross Australia. The stories which underpin the Dreaming are “owned” by the people with ownership rights of the country through which they pass. People with full knowledge (that is, old people who have been fully instructed) may know the Dreaming from top to bottom, but they only “own” that part of the story attached to their country. For this reason much Aboriginal art is referenced by the artist as his or her country. “Aboriginal art is an integral part of the Dreaming – part of the constitution of the ancestral beings, part of their presence and part of their immortality. It is also part of the land itself and all other things that are thought to be creations of, and continue as manifestations of, Dreamtime ancestors. Whenever Aboriginal art is produced and wherever it is exhibited, it involves the exercise of rights that can ultimately be traced to the Dreaming. Those rights are part of what makes it Aboriginal art, and locate it in the world of particular people and places. Without this reference back to the Dreaming art would be mere form – it would have lost its meaning”5. Aboriginal art represents country, the fauna and flora which constitute the totem of the painter, rivers, creeks and waterholes, the ancestors who made the country and the various stories of the Dreaming. They are not maps in a conventional western sense but rather “are conceptual representations which influence the way in which landscape is understood. When Aboriginal paintings do represent features of the landscape, they depict them not in their topographical relations to one another but in relation to their mythical significance”6. This article will focus on two quite different regions of Australia which produce two distinctive styles of art, the western desert and Arnhem Land. Whilst Aboriginal art is not new, its discovery by non-aboriginal society and its acceptance as art is relatively new. As Howard Morphy says: “Aboriginal art was barely recognised as a significant art form until the 1950s and it was not until the 1980s that it began to enter the collections of most Australian galleries, or gain widespread recognition as a significant dimension of Australian art”7. Whilst contemporary western desert acrylic paintings on board and canvas can reasonably be said to date from the early 1970s (in contrast to the earlier ephemeral art of body and sand paintings), art from Arnhem Land, in the form of bark paintings, poles and hollow log coffins, has a much longer history in that form. They may not have found their way into an Australian art gallery until barks of the Yolgnu people from Yirrkala in north eastern Arnhem Land were acquired by Tony Tuckson8 in 19599, but they were in evidence from the earliest days of contact. If collected at all, they were collected for ethnographic museums10. In 1912 Baldwin Spencer spent time in Oenpelli (now called Gunbalanya) in central Arnhem Land. Whilst there he began a collection of bark paintings which grew to over 200 and which are now in the Museum of Victoria. The anthropologist Donald Thomson collected bark paintings in Arnhem Land in the 1930s and the anthropologists Ronald and Catherine Berndt did so in the 1940s11. Contemporary Aboriginal art, whether it is western desert painting, or barks or poles or coffin logs from Arnhem Land, reflects earlier Aboriginal art and is a continuation of art tradition. In speaking of contemporary Aboriginal art Morphy said: “The new category included art from all regions of Australia, with the proviso that the works were in continuity with Aboriginal traditions, and thus part of a trajectory that stretched backwards to the pre-colonial era. It included the art of Arnhem Land – an art whose genesis was independent of European traditions. The category came into being partly because Aborigines asserted the contemporary relevance of their art in the Australian context. It was their contemporary art, it influenced white Australian art and in turn was influenced by the post-colonial context of its production. Aboriginal art, too, represented dynamic and diverse traditions, and for those who were prepared to see, it was an avowedly political art. The category also came to include the acrylic art of the Western and Central Desert”12. A prime example of Aboriginal art being political is its use in a native title claim by the Yolgnu people of Blue Mud Bay in eastern Arnhem Land. They tendered bark paintings to the court and led explanatory evidence as to the meaning of the paintings to establish the continuous practice of traditional law and custom which connected them to their country. The explanatory evidence was given by Yolgnu artists and Howard Morphy in his capacity as an anthropologist expert in the study of Yolgnu bark paintings13. Papunya is a small settlement of Aboriginal people west of Alice Springs established in 1960. As a result of then government policy of assimilation Aboriginal people moved there from a more remote desert life. It comprised Aboriginal people from the same region but from a number of different tribes and language groups, largely Pintupi, Warlpiri, Luritja and Arrernte14. It was not a happy place. Geoffrey Bardon, who was a teacher there, described it as being “in a sense a ghost of a once abundant cultural manifestation in central Australia, a mere thought-shadow of peoples, many of whose ancestors had been massacred, poisoned or starved to death over a period of some generations after their contact with Europeans, and their tribal lands taken for cattle stations or settlements; it was a place of abundant hatred and distress”15. Bardon taught the children art. He got to know some of the men who worked at the school. Soon it became apparent that the men were interested in what the children were doing. That led to the famous Widow’s Dreaming, Wallaby Dreaming, Snake Dreaming and Honey Ant Dreaming murals painted by men on the school walls in June-August 1971. Bardon reports: “I recalled seeing many people I would later know as tribally powerful men looking carefully at the murals both before and after their completion, and there were enormous roars and wild acclamations and dancing and singing in the great camps at night”16. Something momentous had happened: the men had painted their Dreamings which were immediately recognisable to initiated men. From that time on the men of Papunya began to paint on anything which was available, using the “detritus of the white community- floor tiles, masonite and fruit boxes”17. One of the men was Mick Namarari Tjapaltjarri (born about 1926, died 1998). He was a senior initiated man at the time he began to paint. Another was Turkey Tolson Tjupurrula (born about 1942, died 2001). He was an initiated man at the time he began to paint but was “one of the youngest of the original group of Papunya painters”18. Both were Pintupi men. Mick Namarari’s paintings use iconography typical of early western desert art, and “deploy a system of figurative abstraction closely tied to narrative”19. In one work we can see “cliffs at the top of the design with a featured cave; a close study of the intricate patterning reveals at the top, small ceremonial objects, linear water motifs and patterns representing bush tucker, grass and rock…The bottom motif is similar but includes many Ceremonial Men arranged in ritual order…”20 He also depicted a womens’ Dreaming. Mick Namarari painted a huge range of work. He developed work of a distinctive style. He is credited with having transformed Papunya Tula art “away from Clifford Possum Tjapaltjarri’s gridlocked patterns and the potent ancestral epics of Uta Uta Tjangala to the ethereal minimalism of the late 1980s and 1990s”21. His later work which depicts the activities of the bettong (small rat-kangaroo), represented by numerous small scratches. 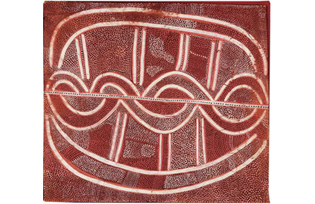 Mick Namarari embodies the concept of continuity and change; his early works were detailed studies of Dreamings for which he was responsible22, in a style similar to all the early Papunya painters, and his later works were abstractions of the same Dreamings, reflecting the fact that he developed his own aesthetic, and was confident of it. The inspiration was the same, its expression different. Turkey Tolson began his painting at Papunya but later returned to his country at Kintore. He said of his work entitled: Porcupine Joke Story which was painted in 1973: “The central spirals are the tracks of the Porcupine Travelling; the concentric circles with opposing loops are two Porcupine men sitting at the stopping places during the Porcupine Being’s journey. There is an element of humour in this work in that the track that separates the sit-down places gets shorter as the destination becomes closer”23. Turkey Tolson’s rightly famous Straightening Spears at Ilyingaungau, (see image) was painted in 1990. The style is markedly different from Porcupine Joke Story and is minimalist in style. Notwithstanding its minimalism it “demonstates a close connectedness between the form of the work, the landscape, and the Dreaming associated with a specific work.24” The story depicts a fight between two groups of men with spears, followed by ceremony25. Turkey Tolson painted works of great variety in style and palate over a long period of time, sometimes employing typical western desert iconography, sometimes minimalism and abstraction. He is an artist confident of his subject matter and his aesthetic. Arnhem Land is the home of bark, poles and hollow log painting and the style of cross- hatching, known as “rarrk”. This paper focuses on two Yolgnu painters from western Arnhem Land, David Malangi, (born about 1927, died 1998) and John Mawurndjul, born in 1952. The work of those two men epitomises traditional bark painting and the change which has occurred over time, but change which is still consistent with what has gone before. 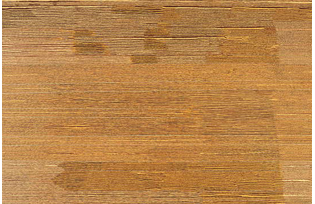 Sayers describes the process of bark painting as beginning “with a sheet of bark cut from a stringybark…tree, specifically for the production of a painting. The sheet of bark is then flattened over a fire. Bark painters use a range of colours derived from red and yellow ochres, pipeclay and charcoal, together with a binder (such as orchid-sap or synthetic glues). This is applied using brushes of chewed fibres or hairs”. Morphy says “painting is seen as a process of transforming a surface from a state of dullness to that of shimmering brilliance…but in [thus] transforming a painting …Yolgnu are not merely producing an aesthetic effect but moving the image towards the ancestral domain. The cross-hatched surface of the painting reflects the power of the ancestral beings it represents, the quality of shininess is the power of the ancestral beings incarnate in the object”27. Malangi had ”custodianship for vast tracts of land…and associated responsibilities for caring for sacred sites recounting the journeys of both Djankawu Creation Ancestors and of the Ancestor Gurrmirringu.28” His work entitled Story of Gurrmirringu “concerns death, mortuary rituals and beliefs about the soul.29” The cross-hatching in his work is minimal, the outlines strongly marked, colours obvious in blocks, a style typical of early Arnhem Land bark painting. Some of his later work in 1991 is sparer, freer, depicting the fish and animals to be found at a waterhole in his country. Malangi was one of the painters of the Aboriginal Memorial, 200 hollow logs which is a memorial to the 200 years of white occupation of Australia, a centrepiece of the National Gallery of Australia in Canberra. The Hollow logs, which are re-burial coffins, “are painted with the clan designs and major Dreamings of the artists” and were intended as a commemoration of those dead Aboriginal people “for whom it had not been possible to conduct appropriate mortuary rites”30. Caruana says “it reflects traditional ceremony and artistic activities which continue to be practised…[and] signifies the important role of art in expressing Aboriginal values and perspectives”31. Yolgnu artists were traditionally conservative in what they painted, often being strictly bound as to the story and its representation. Malangi’s work, and the Aboriginal Memorial in which he collaborated, is typical of that fact. 1 See the discussion in Radford R and Hylton J Australian Colonial Art 1800-1900 Art Gallery of South Australia, 1995 p18.